It’s no secret that LinkedIn has become the world’s largest professional network, with over 562 million users in more than 200 countries and territories worldwide. In the Asia Pacific region alone, membership is now well over 100 million, and we know that most recruiters use the platform to find and/or screen candidates. So how can you leverage the power of LinkedIn to find a job? Search LinkedIn Jobs: Browse the LinkedIn Jobs section to find relevant roles and use filters to refine your search. Create a search alert so you’re notified every time a job that meets your criteria is posted. Update your career interests: Let LinkedIn know you’re seeking work and share your career goals. You can specify the types of companies and roles you’re interested in, so recruiters can match your interests and background to available roles. Your career interests will be shared with recruiters for 180 days before being automatically turned off, but you can manually change this to continue sharing. Find ‘Career Interests’ in the ‘Jobs’ tab at the very top of your profile. Keep your profile up to date: A complete profile will strengthen your image, increase your visibility and bring you more networking opportunities. Complete as many sections as possible to achieve the ‘All Star’ level indicated by the profile strength metre under your summary when viewing your profile. Include everything that’s relevant to the roles you’re seeking, with a focus on your recent experience. Customise your headline: When users search for people with certain attributes, they only see their photo, name and headline. Your headline automatically defaults to your current (or most recent) job title, but you can – and should – customise it to ensure you stand out. Change your headline to encapsulate what you do, the value you offer or the type of roles you’re seeking. Simply click the ‘edit’ button next to the headline (and try to use all 120 available characters). Upload a photo: A photo makes your profile more likely to be viewed. It’s the first thing people see when they’re browsing, and if you don’t have a photo you’re missing out on opportunities. A professional shot is great but not essential – just don’t use a cropped photo from a social situation or an obvious ‘selfie’. Get someone to take a clear head-and-shoulders photo against a white or plain background, and wear something professional. Don’t forget to smile! For more on getting the perfect picture, read our recent article on DIY-ing a professional headshot. Include a summary: Your summary (the overview section at the top of your profile) contributes to your LinkedIn ranking and is one of the first things people read. Use yours to create a concise snapshot of you and your ‘brand’. Describe your background, experience and skills in a way that demonstrates your potential for your target roles. Add a comprehensive list of skills: Your Skills & Endorsements section also helps build your brand and improve your ranking. Select skills that already exist in LinkedIn’s database by starting to type a skill, and LinkedIn will make relevant suggestions. To boost your chances of getting the job you want, don’t leave anything out – you can list up to 50 skills and change the order by dragging up and down. Get recommendations and endorsements: These are invaluable and boost your profile’s strength and personality. Try to get recommendations for each role and include superiors, clients and colleagues since this will boost your credibility. Make your content web friendly: Aim for short paragraphs and concise sentences. To improve readability, use bullet points and subheadings. Consider adjusting the order that things appear within each section to suit your target role or industry. Be active: Share content regularly, making sure it’s relevant, authentic and valuable to your network. It might include articles, blog posts and quotes. Interact with other people and get involved in groups (click ‘My Network’ in the top menu and you’ll see your groups listed in the left-hand sidebar; use the search bar in the top left to search for new groups). The more you interact and post as a professional, the more you’ll get noticed and build recognition. Build your network: Connections help you increase your own exposure and access others. They also allow you to keep track of industry trends and news and create more opportunities for introductions. Research companies you’re interested in: Make a list of the companies you’d like to work for and follow them on LinkedIn. This will help you stay up to date on company news and new positions. Identify which of your connections are associated with the companies. Reach out to them for advice, support or an introduction to HR. Research your recruiter: Before an interview, use LinkedIn to research the interviewer – whether they’re internal or external to the company you want to work with. Use that knowledge during the interview to demonstrate you’ve done your homework. 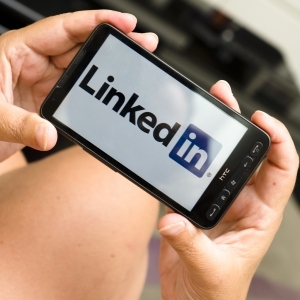 LinkedIn can be a powerful tool for finding and securing the job you want. But it takes a bit of effort to get it right. Take a look at some of the top profiles in your industry for inspiration, and spend time getting to know LinkedIn so you can make the most of its tools. Your dream job could be waiting for you! If you’d like help developing or optimising your LinkedIn profile so you stand out from the crowd, take a look at our LinkedIn Profile Writing service.